There is a temporary exhibit called "Geopalooza! A Hard Rock Anthology" at the Houston Museum of Natural Science. If you are in Houston this summer (until August 24), this is something absolutely worth checking out: you can see some outstanding geodes, crystals, meteorites, and fossil specimens. I have been to many natural history museums, but I rarely get as high as I did at the HMNS the other day ['getting high' is the right terminology here: you get to (or have to) listen to Led Zeppelin and Bob Dylan while looking at the rocks]. Even if you are not too much into rocks, minerals, fossils, and natural science in general, these pieces are so beautiful that they can simply be viewed as works of art. 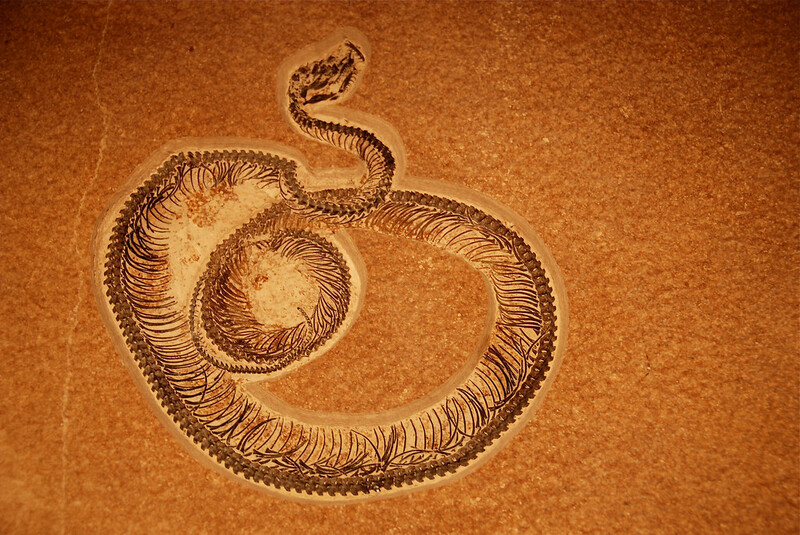 Here is for example a fossil snake from the Eocene Green River Formation in Wyoming. This formation has not only one of the most significant fossil sites in the US, but it also contains the largest oil shale deposit in the country: there are 1.5 trillion barrels of shale oil within the former lake sediments. 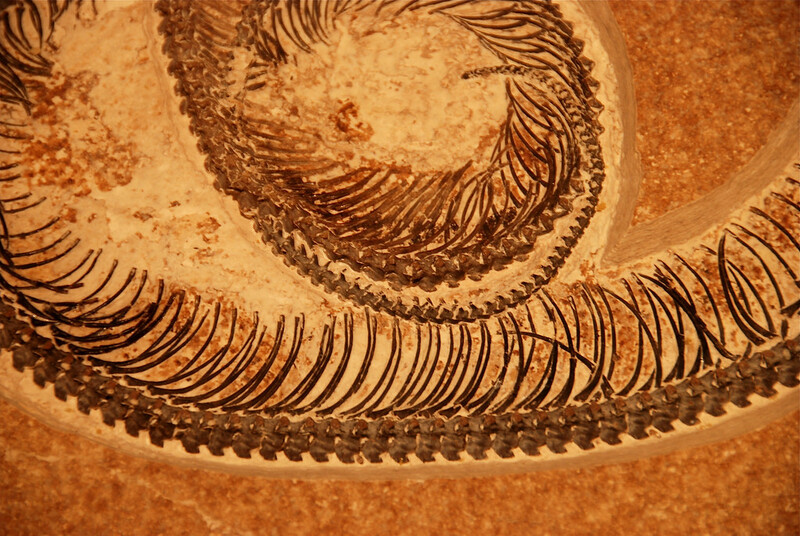 Preservation of both fossils and of organic matter requires special conditions on the lake bottom: a partial or total lack of oxygen not only prevents oxidation of organic material, but also makes life difficult for critters that otherwise would totally churn the sediment and leave no undisturbed animal remains behind. One of the museum curators was around when I was checking out this snake and she explained that the reason why the head bones are in such a disarray - compared to the beautifully arranged backbone and ribs - is that, as the snake's body started to decompose, the easiest way out for the accumulating gases was through the head. I think this snake must belong to the species Boavus idelmani, and is probably one of the best preserved fossil snakes in North America. 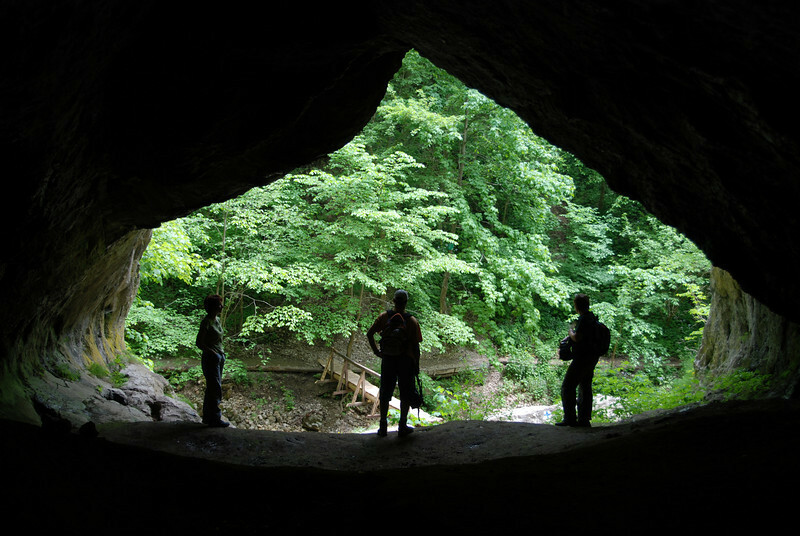 The rest of the photos from Geopalooza are here. 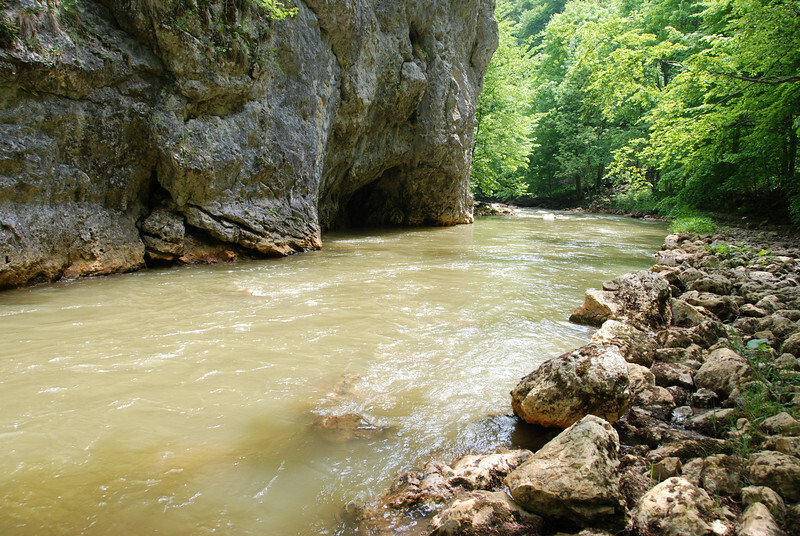 A few weeks ago I have spent some time back home in Transylvania (it is actually a place previously known as home), and took a day to visit a special place, the 'canyon' of the Vargyas River; we used to do a lot of caving and hiking here when I was in high school. A small patch of Mesozoic limestones was somehow forgotten in the middle of a lot of softer pyroclastic deposits, and a nice little canyon developed, with lots of caves and typical karst morphology. Make no mistake, this is not a 'grand' canyon, it is not even among the largest canyons in Romania or Transylvania. But often it is lesser known and more hidden places that have a special atmosphere, a special combination of colors, shapes, shades and minor details that you can never forget. I have pledged a while ago not to blog about Peyto Lake anymore, but I have recently discovered some beautiful GPR profiles that I have to share to make the story more complete. 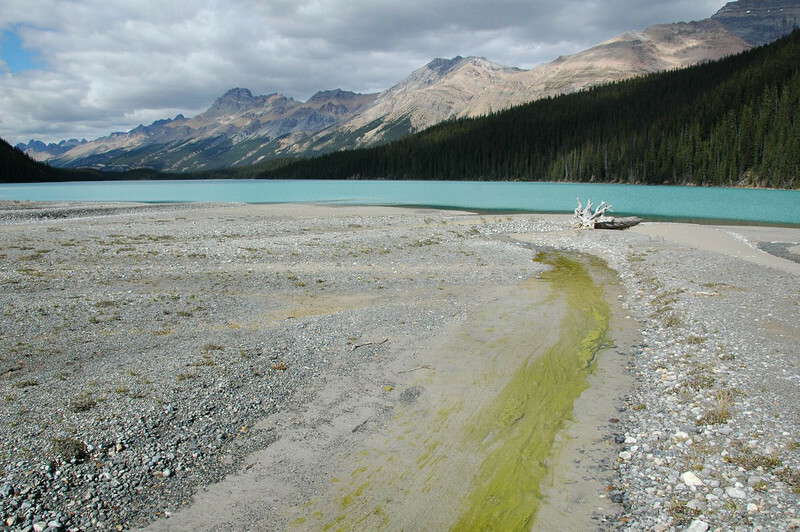 Derald G. Smith of the University of Calgary and Harry M. Jol of the University of Wisconsin - Eau Claire have looked at the internal structure of the Peyto Lake delta using a technology called ground-penetrating radar (GPR). The principles used in GPR data acquisition are similar to those of reflection seismology, but electromagnetic waves are used instead of acoustic energy, and reflections occur at boundaries with different dielectric constants rather than boundaries with different acoustic impedances. Compared to reflection seismic surveying (or digging a deep hole), the nice thing about GPR is that it is non-destructive: it can be used in situations where you want as little disturbance as possible. For example, it would be a bad idea to do seismic surveying of a leaking reservoir, but it is OK to look for the leaks using GPR. GPR is also used by archaeologists. But let's return to Peyto Lake. Although it has long been postulated that coarse-grained deltas with steep slopes (called Gilbert deltas, after the American geologist G.K. Gilbert) have a simple internal structure consisting of a topset, foreset, and bottomset, - and there are numerous ouctrop examples that show small coarse-grained deltas with such a structure -, it is not easy to prove that modern-day active deltas behave the same way. 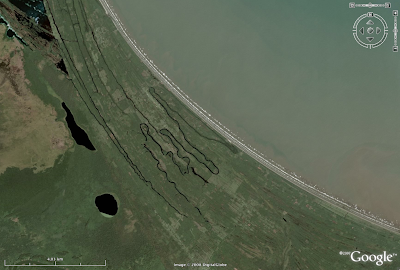 You can easily walk around on the top of the Peyto Lake delta and examine the surface morphology and characteristics in as much detail as you want; but without cool technology like GPR you can only wonder what does it look like inside. 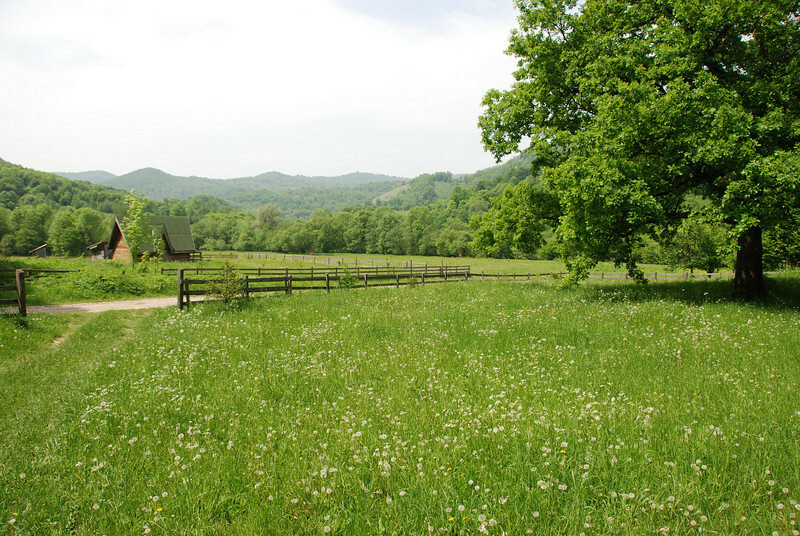 [Digging a large trench in the middle of one of the most beautiful national parks is not an option.] So Smith and Jol set out to check whether the topset-foreset-bottomset geometry is valid for this delta or it has a more complicated internal structure. With only one day of data collection in the field (kind of unusual in the earth sciences! ), they have clearly shown that the river feeding Peyto Lake is indeed building a textbook example of a simple Gilbert-type delta. The near-horizontal topset layers consist of gravels deposited by the braided river that is active today on the top; the underlying foresets are also likely to be coarse-grained and they dip at about 25 degrees toward the lake. This angle is close to the underwater angle of repose. It is somewhat puzzling why the authors do not talk at all about the fate of finer-grained sediments (sand, silt, mud) that enter the lake; it is clear that turbidity currents directly originating from the river mouths are important agents of sediment transport in the lake (see more about this here). [They were probably focusing on presenting the results of the GPR survey.] 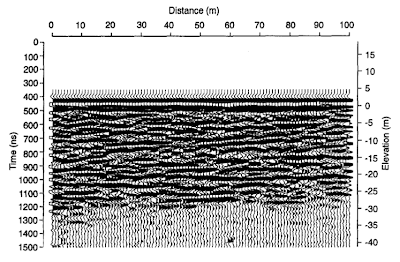 The GPR signal is strongly attenuated in sediment finer than sand, and this might be the reason why reflections get poorly defined in the area where the bottomset is supposed to develop. In fact, I am not convinced I can differentiate the 'bottomset facies' the authors talk about. It is also worthwhile looking at a section perpendicular to this; note how different the topset and foreset look like in this direction. Reflections are much more discontinuous in this image, suggesting that the spatial scale of sediment transport is more limited in a direction perpendicular to the river flow on the top of the delta (this is kind of obvious) and perpendicular to downslope processes within the lake (this is not so obvious). It must be obvious by now that I am a lazy blogger - it looks like I settled down to a comfortable and boring average of one post per month. But. I got back my WoGE-mojo yesterday, and bumped into Peter's WOGE screenshot while gliding over the karstified limestones of the Dinarides in Montenegro. So here is WoGE number 138. No rules. Have fun.